his page only lists additions that are informational; it does not list reorganization or additions of tables, etc. I recommend looking over the pages you've been to previously because I tinker with them fairly often. New edition is here - "Clan Kinsella's History of Ireland." See link on front page. Added Google Search engine for better results. Added Birth-Marriage-Death Certificates to the links page. 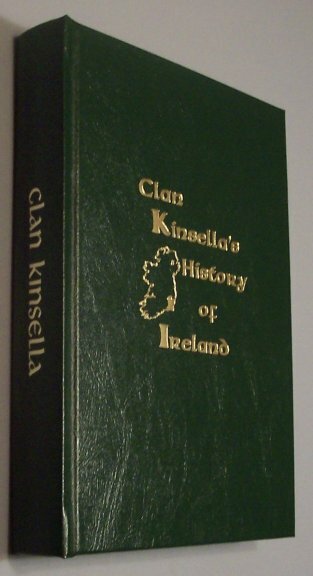 Sold out - "Clan Kinsella's History of Ireland." If you want to be on the list for the next printing let us know. Added links on Links page. Added Site Map to the page. Has a listing of the major pages on the site. Added a new section to the Genealogy page "Genetics and Genealogy"
Added some new links to links page. Added to Genealogy page, various ships lists with Kinsellas. Added Text navigation bars to the bottom of all pages. Reorganized and cleaned up various pages. Added links to some Affinity programs that visitors might find useful.